Iron is an essential element for almost all living organisms as it participates in a wide variety of metabolic processes, including oxygen transport. Iron deficiency, also known as anaemia, occurs when the body doesn’t have enough iron to produce haemoglobin. Haemoglobin is the part of red blood cells that gives blood its red colour and enables the red blood cells to carry oxygenated blood throughout your body. Anaemia means you don’t have enough red blood cells, or haemoglobin, to be healthy. So what symptoms can develop if you have an iron deficiency? One sign to note is tinnitus which can cause ringing in a person’s ear. 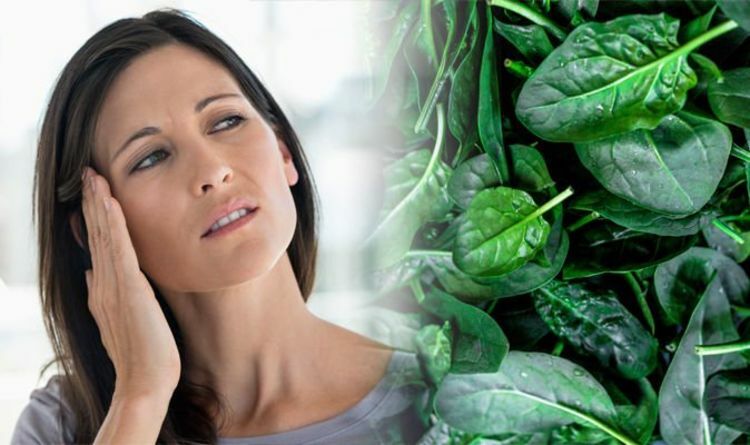 It is unknown exactly what causes this but a link between tinnitus and iron deficiency has been shown, according to research by the University of Maryland Medical Center. Other sounds tinnitus can cause include buzzing, whooshing, humming, hissing throbbing, music or singing. But this isn’t the only symptom of iron deficiency to be aware of, according to Michela Vagnini at Natures Plus. So who is most at risk of iron deficiency? Michela explained: “People can become deficient in iron if they lose a lot of blood due to injuries, surgeries , a haemorrhage or slow, chronic blood loss within the body — such as from a peptic ulcer. Iron deficiency is also very common in women due to menstruation, pregnancy and breastfeeding. “It is very possible for a woman to suffer low iron during her life unless she suffers from Hemochromatosis, an inherited condition in which iron levels in the body slowly build up over many years. Iron from food is absorbed into your bloodstream in your small intestine. This means that those who have an intestinal disorder, such as celiac disease, which affects your intestine’s ability to absorb nutrients from digested food, can be at risk of iron deficiency. If part of the small intestine has been bypassed or removed surgically, that may also affect your ability to absorb iron and other nutrients. The NHS says a simple blood test by your GP will confirm if you’re anaemic. Eating iron-rich foods can help you prevent a deficiency.